You’re ready to make this your year to break out from the pack and become a top performer. Thinking about success is simply not going to be enough. It takes a plan and one of the best things you can do is emulate what other top performers do. 1. Don’t build your plan to make your quota. Build your plan to blow past your quota. Top performers aren’t interested in making their numbers. They want to make numbers nobody else feels are possible. 2. Marshall the resources you’ll need to succeed immediately. During the course of the year, there will be times when you need to tap a subject matter expert. Waiting until you need one is not the time to find them. Build those relationships now to allow you to access them without any delay when you need them. 3. Block time to prospect from the start. Top performers never make excuses. They prospect regularly regardless of the time of year. 4. Build out the plan with the right mix of new and existing business. Too many salespeople get into trouble by thinking they’re going to get more out of existing clients, only to find themselves falling short too late in the year to correct it. 5. Build in time for yourself to breathe and enjoy life. As much as top performers love running at full speed, they also know how to step away from the business to relax and recharge. 6. Don’t build a “to-do” list. Instead, build your day around your schedule. Top performers know the most valuable asset they have is their time and as a result they schedule everything they need to do in their calendar. Scheduling “to do” activities in the calendar prevents them from taking up time you don’t have. “Revenue producing activities” mean not getting caught up doing the routine stuff too many salespeople do, which is nothing more than shuffling paper, sitting in meetings, etc. Developing your personal skillset is critical when it comes to industry knowledge, selling skills and leadership. 8. Believe in yourself. Accept nothing less than the best from yourself, regardless of the situation you find yourself in. Top performers don’t pass blame. They accept responsibility and they make it a part of their DNA and the way they stay motivated. Let’s have fun making this year an amazing year. Over the coming weeks, I’m going to share a significant number of insights to help you succeed. January represents 1/12 of the year. We can’t afford to waste it if we intend to make the year a huge success. Is your team having a sales kickoff meeting? You need to contact me immediately. You can’t afford to not make the meeting the best it can be and that’s exactly where I can help you. You’ve been reading my content and now it’s time to hear it live and in the moment. Call me at 402.445.2110 or email me. Let’s talk and let’s get things moving. 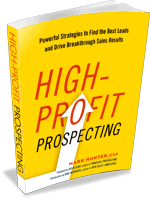 In the meantime, check out my best-selling book, High-Profit Prospecting. PrevPreviousIs Your Personality Selling For You or Against You? Thanks for the tips, very timely for 2017!